Top Shelf DJ’s are joined weekly by guest Jazz Musicians and Poets. Engaged behind the decks we are joined by DJ’s Concise, Enzo and Master Selector Idea! 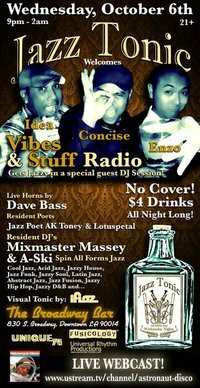 Vibes & Stuff Radio invades Jazz Tonic! Bringing the Jazzy tones and the visual tonic we have many of the people behind LA’s premier Ustream underground Music channel, Vibes & Stuff Radio. Weekly their show features the cream of the crop of Los Angeles and worldwide talent from the DJ and music world in a really creative format including interviews along side the live DJ sessions. a.k.a. Kerry Sawyers, has exhibited throughout Southern California and her hometown of San Luis Obispo. After having lived in both areas she has come to appreciate the beauty in all things, big city and small town. Photography came as a hobby after doing photos for events and DJ’s. Having grown to develop her own style, “MOVE ME” became her established website and logo. Illafresh showcases a sense of life and “in the moment” captures to her images. Check it out and assimilate Vibes and Stuff Radio into your rotation of regular music sources. These folks just make life better, plus you can preview that DJ you’ve been hearing about before you go out to the club! This entry was posted on October 5, 2010 by unique74mag. It was filed under Unique 74 and was tagged with jazz tonic, Unique74, Vibes and Stuff Radio.